Carinotetraodon salivator Lim & Kottelat 1995. Found in Asia: Sarawak, Malaysia, in relatively fast-moving streams, around and burrowing in the substrate. Chonerhinos amabilis Roberts 1982. Indonesia. To three inches in length. Feeds on aquatic insect larvae. Chonerhinos nefastus Roberts 1982.Asia: Indonesia and Indochina. To three inches in length. Chonerhinos remotus Roberts 1982. Asia: Indonesia. To two and a half inches in length. Chonerhinos asellus Roberts 1982. Asia: Indonesia. To three inches in length. 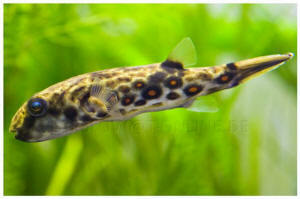 Genus Takifugu: (21 spp.). Mostly brackish to freshwater. Used as sushi bar "highs"... but don't get too close to death! Takifugu oblongus (Bloch 1786), the Lattice Blaasop. Indo-West Pacific: South Africa; Indonesia to Australia. Brackish to Marine. To sixteen inches in length. Takifugu ocellatus (Linnaeus 1758). Freshwater, Brackish. Found in China. Rolf Bandsma photo. Tetraodon biocellatus Tirant 1885, the Figure Eight Puffer. Asia: Indochina, Malaysia and Indonesia. Often sold as freshwater, but do best in slightly brackish (spg. 1.005); pH range: 6.5 - 7.5; dH range: 5.0 - 12.0. A fish-biter. To a little over two inches in length. Aggressive fish tanks only. A biter! 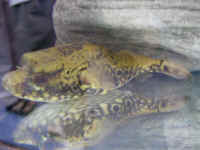 Tetraodon steindachneri Dekkers, 1975 is an invalid synonym for this species. Tetraodon duboisi Poll 1959. To 8.7 cm. Known only from the Stanley Pool area of the Congo. Aquarium photo. 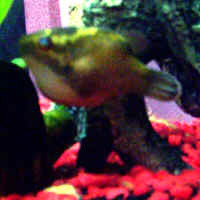 Tetraodon leiurus Bleeker 1851, Asian Freshwater Puffer. Asia: Sundaland, Indochina. Freshwater, brackish; pH range: 7.0; dH range: 12.0. Sometimes imported and sold as an aquarium fish. A terror in the way of being a fin nipper. 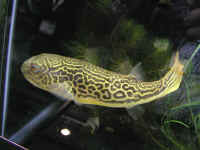 Tetraodon lineatus Linnaeus 1758, the Fahaka, Lined Freshwater Puffer. Africa: Nile, Chad basin, Niger, Volta, Gambia, Geba and SÃ©nÃ©gal Rivers. Freshwater, brackish; pH range: 7.0; dH range: 10.0. Infrequently imported. To seventeen inches in length. 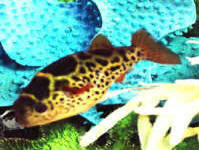 Tetraodon mbu Boulenger 1899, Mbu Freshwater Puffer. Africa: widely distributed in Lake Tanganyika and the Congo basin. Freshwater, brackish. To some twenty six inches in length in the wild. 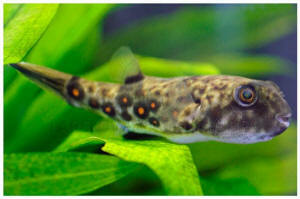 The most commonly imported freshwater puffer from Africa. This eight inch one in a trade show aquarium. Tetraodon pustulatus Murray 1857, the Puffer (aka GSP). Freshwater to brackish; Africa, Nigeria, Gross River. To 36 cm. @ 14 inches overall length. Unfortunately the majority of "freshwater" puffers sold (which are actually brackish to marine) are quite susceptible to infectious and parasitic disease. Without good water quality (consistent, partial marine conditions) the non-freshwater tetraodonts frequently succumb to ich (white spot disease, ichthyophthirius), or become plagued with unsightly lymphocystis. They respond well to common therapies for all. Shown: an otherwise healthy Tetraodon nigroviridis with ich. Burgess, Warren E. 1983. The Amazon puffer, Colomesus asellus (Not C. psittacus). TFH 12/83. Feigs, G. 1957. Tetraodon schoutedeni (Fresh-water puffers spawn). TFH 9-10/57. Frank, Stanislav & Jaroslav Elias. 1974. Chonerhinus naritus. TFH 4/74. Jackson, Lee. 94. Puffers of the genus Chonerhinos. FAMA 7/94. Jensen, Christopher. 1993. Pufferfish. FAMA 10/93. Ladiges. Undated. Puffer Fish. ADI #27. Noshnow, Anatoli. 1987. Puffer production: Spawning Tetraodon cutcutia. TFH 10/87. Thomas, Scott B. 1985. Those practical fresh-water puffers. FAMA 5/85.